This special evening to benefit KJazz 88.1 FM stars the GRAMMY®-award winning vocalist Dianne Reeves. DIANNE REEVES is one of THE pre-eminent jazz vocalists in the world. As a result of her breathtaking virtuosity, improvisational prowess, and unique jazz and R&B stylings, Reeves received the GRAMMY® for Best Jazz Vocal Performance for three consecutive recordings — a GRAMMY® first in any vocal category. Featured in George Clooney’s six-time Academy Award nominated Good Night, and Good Luck, Reeves won the Best Jazz Vocal Grammy for the film's soundtrack. 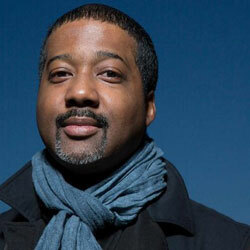 Reeves has recorded and performed with Wynton Marsalis and the Lincoln Center Jazz Orchestra. She has also recorded with the Chicago Symphony Orchestra conducted by Daniel Barenboim and was a featured soloist with Sir Simon Rattle and the Berlin Philharmonic. Reeves was the first Creative Chair for Jazz for the Los Angeles Philharmonic and the first singer to ever perform at Walt Disney Concert Hall. In recent years Reeves has toured the world in a variety of contexts including “Sing the Truth,” a musical celebration of Nina Simone which also featured Liz Wright and Angelique Kidjo. She performed at the White House on multiple occasions including President Obama's State Dinner for the President of China as well as the Governors’ Ball. Reeves’ most recent release Beautiful Life, features Gregory Porter, Robert Glasper, Lalah Hathaway and Esperanza Spalding. Produced by Terri Lyne Carrington, Beautiful Life won the 2015 Grammy for Best Jazz Vocal Performance. Reeves is the recipient of honorary doctorates from the Berklee College of Music and the Juilliard School. This year the National Endowment for the Arts will designate Reeves a Jazz Master — the highest honor the United States bestows on jazz artists. Opening the benefit concert for KJazz is the KJAZZ ALL-STARS, featuring Joe LaBarbera, Justo Almario, Eric Reed, and Mike Gurrola. 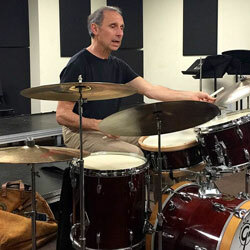 Drummer JOE LABARBERA has enjoyed a long and varied career in music with some of the finest names in jazz. He began his professional career playing with Woody Herman and the Thundering Herd, followed by the Chuck Mangione Quartet. Then it was onto New York and a fruitful two-year period of freelancing with Jim Hall, Phil Woods, Art Farmer, Gary Burton, Art Pepper, John Scofield, Bob Brookmeyer and Toots Thielmans to name just a few. In 1978 Joe was asked to join Bill Evans in what was to become a landmark trio. After Bill's untimely death in 1980, Joe joined pop singer Tony Bennett. Currently residing in Los Angeles, Joe is involved in a wide range of music locally, nationally and internationally. Since 1993, Joe has been on the faculty of California Institute of the Arts. JUSTO ALMARIO, a native of Colombia, was only 19 years old when he was awarded a full scholarship to study at the prestigious Berklee School of Music. While a student, he was discovered by Mongo Santamaria, who heard him play and subsequently sought him out to work as the band’s musical director. Justo has worked with the biggest names in music including Freddie Hubbard, Patrice Rushen, Herb Alpert, Dave Grusin, Abraham Laborial, and George Duke. His musical presence can be heard on numerous GRAMMY awarded records in multiple genres and Justo is equally respected as a producer, having consulted with Charles Mingus on a Cumbia Jazz Fusion record in ‘78, which is considered to be one on Mingus’ best works. 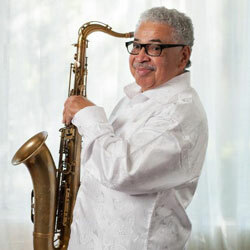 Most recently he co-produced Jose Rizo’s Jazz On The Latin Side All Stars Vol 1. ERIC REED has enjoyed a 30-year career as a professional pianist, composer, arranger, conductor, producer, and mentor. From his LAUSD education, The Colburn School and CSUN, mentoring by his west coast tutors Clora Bryant, Gerald Wilson, John & Jeff Clayton, Gerald Wiggins, and Buddy Collette, up through the bandstands of Freddie Hubbard, Joe Henderson, and Wynton Marsalis, Eric has amassed a prolific list of credits on recordings, film & TV scores, musical theater, and in prestigious venues the world over. As a leader, he has yielded over 20 albums, including classics It's All Right to Swing, The Swing and I, and Pure Imagination. His latest release is entitled A Light in Darkness recorded for the WJ3 label. 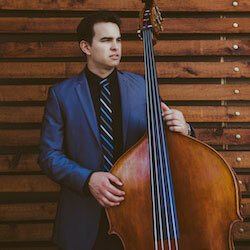 MIKE GURROLA has claimed his place as one of the most sought-after and well-regarded bassists on the west coast, performing most regularly with Eric Reed. By his late teens, Mike was already gigging around L.A. with the likes of Kevin Kanner, Josh Nelson, Nick Mancini, and Melissa Morgan. Mike also began playing with guitarist Graham Dechter, whose quartet includes Jeff Hamilton on drums. When not in one of his regular roles, he has been in high demand with some of the finest in jazz, including Gerald Clayton, Benny Green, Harold Mabern, Willie Jones III, and Pharaoh Sanders.